While general use of the Services does not require an account, if you want to use certain features of the Services you’ll have to create an account (“Account”). You can do this via the Site or through your account with certain third-party social networking services such as Facebook or Twitter (each, an “SNSAccount”). If you choose the SNS Account option we’ll create your Account by extracting from your SNS Account certain personal information such as your name and email address and other personal information that your privacy settings on the SNS Account permit us to access. We welcome feedback, comments and suggestions for improvements to the Services (“Feedback”). You can submit Feedback by emailing us at support@gifs.com. You grant to us a non-exclusive, worldwide, perpetual, irrevocable, fully-paid, royalty-free, sublicensable and transferable license under any and all intellectual property rights that you own or control to use, copy, modify, create derivative works based upon and otherwise exploit the Feedback for any purpose. For purposes of these Terms: (i) “Content” means GIFs, animated GIFs, text, graphics, images, music, software, audio, video, written posts or comments, captions, works of authorship of any kind, and information or other materials that are posted, generated, provided or otherwise made available through the Services; and (ii) “User Content” means any Content that you provide to be made available through the Services. Content includes without limitation User Content but excludes the YouTube URLs or any video content from YouTube. Glyphic does not claim any ownership rights in any User Content and nothing in these Terms will be deemed to restrict any rights that you may have to use and exploit your User Content. Subject to the foregoing, Glyphic and its licensors exclusively own all right, title and interest in and to the Services and Content, including all associated intellectual property rights. You acknowledge that the Services and Content are protected by copyright, trademark, and other laws of the United States and foreign countries. You agree not to remove, alter or obscure any copyright, trademark, service mark or other proprietary rights notices incorporated in or accompanying the Services or Content, including User Content from other users. You shall abide by and maintain all copyright notices, information and restrictions contained in any Content accessed through the Services. By making any User Content available through the Services you hereby grant to Glyphic and other users of the Services a non-exclusive, transferable, sublicenseable, worldwide, royalty-free license to use, copy, modify, create derivative works based upon, distribute, publicly display, publicly perform and distribute your User Content in connection with operating and providing the Services and Content to you and to other users, including without limitation, for promoting and redistributing the Content in any media formats (including without limitation, our feed (if you choose to upload your animated GIFs thereto), third-party websites and via our API). You are solely responsible for all your User Content and Glyphic shall not be liable in any way for any User Content made available via the Services. You represent and warrant that you own all your User Content or you have all rights that are necessary to grant us the license rights in your User Content under these Terms. You also represent and warrant that neither your User Content, nor your use and provision of your User Content to be made available through the Services, nor any use of your User Content by Glyphic on or through the Services will infringe, misappropriate or violate a third party’s intellectual property rights, or rights of publicity or privacy, or result in the violation of any applicable law or regulation. By using the Services, you may be exposed to certain Content from other users that could be offensive, indecent or otherwise not in line with your expectations. You bear all risks associated with the use of any Content in connection with the Services. You may notify Glyphic of any User Content that you believe violates these Terms by emailing Glyphic at support@gifs.com. Subject to your compliance with these Terms, Glyphic grants you a limited, non-exclusive, non-transferable, non-sublicensable license to download, view, copy, display and print the Content solely in connection with your permitted use of the Services and solely for your personal and non-commercial purposes, including, without limitation, to allow you to create animated GIFs from YouTube videos and share them with other users or other third parties. Subject to your compliance with these Terms, Glyphic grants you a limited non-exclusive, non-transferable, non-sublicenseable license to download and install a copy of the App on a mobile device or computer that you own or control and to run such copy of the App solely for your own personal non-commercial purposes. You may not copy the App, except for making a reasonable number of copies for backup or archival purposes. Except as expressly permitted in these Terms, you may not: (i) copy, modify or create derivative works based on the App; (ii) distribute, transfer, sublicense, lease, lend or rent the App to any third party; (iii) reverse engineer, decompile or disassemble the App; or (iv) make the functionality of the App available to multiple users through any means. Glyphic reserves all rights in and to the App not expressly granted to you under these Terms. Optional premium paid services are available on the Website. By selecting a premium service you agree to pay Glyphic, Inc. the monthly or annual subscription fees indicated for that service. Payments will be charged on the day you sign up for a premium service and will cover the use of that service for a monthly or annual period as indicated. Premium service fees are not refundable. Although we’re not obligated to monitor access to or use of the Services or Content or to review or edit any Content, we have the right to do so for the purpose of operating the Services, to ensure compliance with these Terms, and to comply with applicable law or other legal requirements. We reserve the right, but are not obligated, to remove, monitor, prohibit, edit, delete or disable access to any Content (including without limitation your own User Content), at any time and without notice, including, but not limited to, if we, at our sole discretion, consider any Content to be objectionable or in violation of these Terms. We have the right to investigate violations of these Terms or conduct that affects the Services. We may also consult and cooperate with law enforcement authorities to prosecute users who violate the law. Glyphic respects copyright law and expects its users to do the same. It is Glyphic’s policy, in appropriate circumstances, to terminate access or remove Content from the Services from Account holders or users who repeatedly infringe or are believed to be repeatedly infringing the rights of copyright holders. 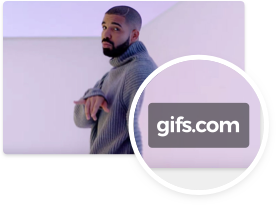 Please contact dmca@gifs.com to support a DMCA complaint. The Services and App may contain links to third-party websites or resources, including, but not limited to, YouTube. We provide these links only as a convenience and are not responsible for the content, URLs, products or services on or available from those websites or resources or links displayed on such websites. You acknowledge sole responsibility for and assume all risk and liability arising from, your use of any third-party websites or resources. The inclusion of links to YouTube videos in our Services does not imply our endorsement or any association or affiliation between us and YouTube. We may terminate your access to and use of the Services, at our sole discretion, at any time and without notice to you. If you have an Account, you may cancel it at any time by sending an email to us at support@gifs.com. Upon any termination, discontinuation or cancellation of the Services or your Account, all provisions of these Terms which by their nature should survive will survive, including, without limitation, ownership provisions, warranty disclaimers, limitations of liability, and dispute resolution provisions. You will indemnify and hold harmless Glyphic and its officers, directors, employee and agents, from and against any claims, disputes, demands, liabilities, damages, losses, and costs and expenses, including, without limitation, reasonable legal and accounting fees arising out of or in any way connected with (i) your access to or use of the Services or Content, (ii) your User Content, or (iii) your violation of these Terms. NEITHER GLYPHIC NOR ANY OTHER PARTY INVOLVED IN CREATING, PRODUCING, OR DELIVERING THE SERVICES OR CONTENT WILL BE LIABLE FOR ANY INCIDENTAL, SPECIAL, EXEMPLARY OR CONSEQUENTIAL DAMAGES, INCLUDING LOST PROFITS, LOSS OF DATA OR GOODWILL, SERVICE INTERRUPTION, COMPUTER DAMAGE OR SYSTEM FAILURE OR THE COST OF SUBSTITUTE SERVICES ARISING OUT OF OR IN CONNECTION WITH THESE TERMS OR FROM THE USE OF OR INABILITY TO USE THE SERVICES OR CONTENT, WHETHER BASED ON WARRANTY, CONTRACT, TORT (INCLUDING NEGLIGENCE), PRODUCT LIABILITY OR ANY OTHER LEGAL THEORY, AND WHETHER OR NOT GLYPHIC HAS BEEN INFORMED OF THE POSSIBILITY OF SUCH DAMAGE, EVEN IF A LIMITED REMEDY SET FORTH HEREIN IS FOUND TO HAVE FAILED OF ITS ESSENTIAL PURPOSE. SOME JURISDICTIONS DO NOT ALLOW THE EXCLUSION OR LIMITATION OF LIABILITY FOR CONSEQUENTIAL OR INCIDENTAL DAMAGES, SO THE ABOVE LIMITATION MAY NOT APPLY TO YOU. IN NO EVENT WILL GLYPHIC’S TOTAL LIABILITY ARISING OUT OF OR IN CONNECTION WITH THESE TERMS OR FROM THE USE OF OR INABILITY TO USE THE SERVICES OR CONTENT EXCEED THE AMOUNTS YOU HAVE PAID TO GLYPHIC FOR USE OF THE SERVICES OR CONTENT OR ONE HUNDRED DOLLARS ($100), IF YOU HAVE NOT HAD ANY PAYMENT OBLIGATIONS TO GLYPHIC, AS APPLICABLE. THE EXCLUSIONS AND LIMITATIONS OF DAMAGES SET FORTH ABOVE ARE FUNDAMENTAL ELEMENTS OF THE BASIS OF THE BARGAIN BETWEEN GLYPHIC AND YOU. or class member in any purported class action or representative proceeding. Further, unless we otherwise agree in writing, the arbitrator may not consolidate more than one person's claims, and may not otherwise preside over any form of any class or representative proceeding. If this specific paragraph is held unenforceable, then the entirety of this “Dispute Resolution” section will be deemed void. Except as provided in the preceding sentence, this “Dispute Resolution” section will survive any termination of these Terms. Unless we otherwise agree, the arbitration will be conducted in the county where you reside. If your claim does not exceed $10,000, then the arbitration will be conducted solely on the basis of the documents that we and you submit to the arbitrator, unless you request a hearing or the arbitrator determines that a hearing is necessary. If your claim exceeds $10,000, your right to a hearing will be determined by the AAA Rules. Subject to the AAA Rules, the arbitrator will have the discretion to direct a reasonable exchange of information by the parties, consistent with the expedited nature of the arbitration. The arbitrator will render an award within the time frame specified in the AAA Rules. The arbitrator’s decision will include the essential findings and conclusions upon which the arbitrator based the award. Judgment on the arbitration award may be entered in any court having jurisdiction thereof. The arbitrator’s award of damages must be consistent with the terms of the “Limitation of Liability” section above as to the types and amounts of damages for which a party may be held liable. The arbitrator may award declaratory or injunctive relief only in favor of the claimant and only to the extent necessary to provide relief warranted by the claimant’s individual claim. If you prevail in arbitration you will be entitled to an award of attorneys’ fees and expenses, to the extent provided under applicable law. We will not seek, and hereby waive all rights we may have under applicable law to recover, attorneys’ fees and expenses if it prevails in arbitration. Notwithstanding the provisions of the “Changes to Terms or Services” section above, if we change this “Dispute Resolution” section after the date you first accepted these Terms (or accepted any subsequent changes to these Terms), you may reject any such change by sending us written notice (including by email to support@gifs.com) within thirty (30) days of the date such change became effective, as indicated in the “Last Updated” date above or in the date of our email to you notifying you of such change. By rejecting any change, you are agreeing that you will arbitrate any Dispute between us in accordance with the provisions of this “Dispute Resolution” section as of the date you first accepted these Terms (or accepted any subsequent changes to these Terms). These Terms constitute the entire and exclusive understanding and agreement between Glyphic and you regarding the Services and Content, and these Terms supersede and replace any and all prior oral or written understandings or agreements between Glyphic and you regarding the Services and Content. If for any reason a court of competent jurisdiction finds any provision of these Terms invalid or unenforceable, that provision will be enforced to the maximum extent permissible and the other provisions of these Terms will remain in full force and effect. You may not assign or transfer these Terms, by operation of law or otherwise, without Glyphic’s prior written consent. Any attempt by you to assign or transfer these Terms, without such consent, will be null. Glyphic may freely assign or transfer these Terms without restriction. Subject to the foregoing, these Terms will bind and inure to the benefit of the parties, their successors and permitted assigns. Any notices or other communications provided by Glyphic under these Terms, including those regarding modifications to these Terms, will be given: (i) via email; or (ii) by posting to the Services. For notices made by e-mail, the date of receipt will be deemed the date on which such notice is transmitted. Glyphic’s failure to enforce any right or provision of these Terms will not be considered a waiver of such right or provision. The waiver of any such right or provision will be effective only if in writing and signed by a duly authorized representative of Glyphic. Except as expressly set forth in these Terms, the exercise by either party of any of its remedies under these Terms will be without prejudice to its other remedies under these Terms or otherwise.